Rating: 4.8/10. From 13 votes. Summary: The description, specs, photo, and pricing of the SIG Sauer P938-22 pistol. The P938-22 from the left. Note: SIG says you can convert this pistol to 9mm. .22 LR 10+1 4.1″ 5.9″ 1.1″ 3.9″ 16 oz. 9mm 6+1, 7+1 4.1″ 5.9″ 1.1″ 3.9″ 216 oz. This entry was posted in .22 LR, $501-$750, 9mm, Compact, Semiauto, SIG Sauer, Subcompact on November 23, 2016 by Staff. I traded a single six for a Sig Sauer P938-22 Standard model with the night sights. Super light handgun, feels great in my hand. I’m an old time 1911 guy and this matches the battery of arms very well. I also have the Kimber Micro 9 for the same reason. This 22 is a great practice gun for the micro 9s. It shoots very well. I haven’t had a single Melfunction of any kind. Yes you do need to learn some new tricks To operate it to operate it but can not complain about that at all. This gun has more options than any other 22lr for the same price range. 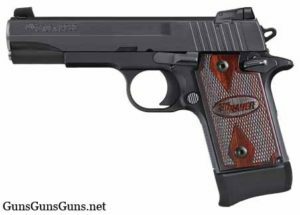 I highly recommend this pistol I highly recommend this pistol.